Today's Beautiful Irish Brands is spotlighting Jane McTernan and her brand MONDSS. In MONDSS Jane has created an innovative product designed to fill a gap in the market. Jane has told me that before the creation of MONDSS she had previously tried to wear tissues under her arms to prevent perspiration marks on a warm day, now when I heard this I thought I have actually done this too! If like me you have tried this you will know that It does not work very well and so after searching in pharmacies and online for a dedicated underarm wear product Jane found out that no such product existed and so in a very entrepreneurial manner set about creating one. Jane came up with the name MONDSS as she wanted link her products with girls best friend diaMONDS with the most amazing tagline of 'Women Don't sweat, they sparkle'. The word MONDSS is also a catchy short word that Jane hopes to achieve 'SPANX' status with where they would be universally associated with underarm wear! MONDSS are exclusively available on www.mondss.com and cost €9.99 for a box containing 10 mondss which is enough for 5 wears. 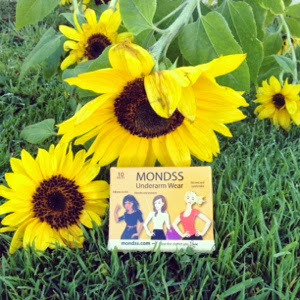 As always with my Beautiful Irish Brands series I have tried out MONDSS so that I can review them for you. When I first saw MONDSS they really reminded me of odd shaped plasters that just looked slightly more breathable. The rules with MONDSS are simple, your underarm should be clean, dry and free from hair. You can wear them alone or with roll on deodorant so I tried them both ways for review purposes. I don't sweat that much but in some clothes it doesn't take much to give you a gigantic sweat patch so for my testing days I strategically chose silk tops that are awful for creating patches and deodorant stains etc. They can really only be worn underneath clothes with t-shirt length sleeves or longer. I found the MONDSS really simple to apply as there is a diagram in the pack that is easy to follow. At first you could feel it under your arm like wearing a plaster and my initial thought was I wouldn't be able to wear this for very long. I was really pleasantly surprised when only about 2-3 minutes later It was as if I had nothing on I couldn't feel It at all! I was worried that there would be a little whiff without deodorant as Its something I wouldn't even walk around the house without wearing normally. I wore the MONDSS all day and tried to do as much activity as possible, I did my weekly shopping, played with my dog and did lots of housework. The MONDSS really kept any odour that was there locked in and my top was kept completely free from any patches. I did feel more comfortable wearing them with deodorant on but I didn't notice a difference in odour just a mental reaction I think. 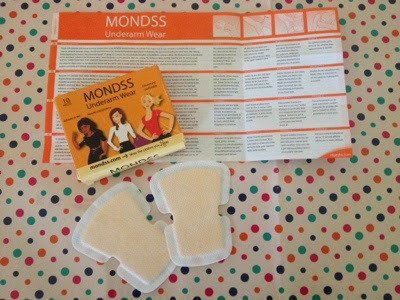 I was really impressed with MONDSS and think they are a really clever solution to combatting sweat patches and could become a staple for interviews and any special occasions. Get yourself a pack of MONDSS and lets help Jane achieve 'SPANX' status with her innovative Underarm Wear.